Dairy infrastructure can have a major impact on milking efficiency and the comfort of cows and milkers. Upgrading an existing dairy or installing a new dairy are big projects that often require a large outlay. Ask yourself - isn't it time to upgrade the old shed? A decision to change the dairy should be based on a genuine need for improved infrastructure. It should be financially viable and support the achievement of the farm’s goals. Generally a change in the milk harvesting system cannot be assessed in isolation from the rest of the farm business. A major upgrade or a new dairy is not 'just a shed' but has implications for the whole farm system. Current system may be working well but may be too small to cope with future goals i.e. milking more cows, employing more or less labour. Current system may not be working well i.e. the milker is idle or flat out, dairy is too cramped, or it takes too long to milk. In this case it is possible that the extra capacity released by the increased efficiency of a new set up could be used to help generate funds to pay for the investment. Sometimes the motivation for change may be a combination of both - for example, milking may be taking too long and extra income may be needed to cover increasing expenses. 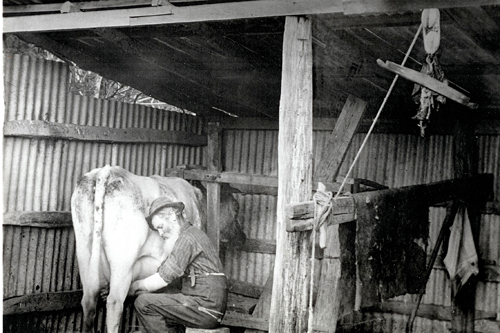 Improved attitudes to the milking job and farming in general. More time to spend on management tasks or being able to attract (and keep) high calibre staff to take over the day-to-day operational tasks. It is important to be very clear about what is motivating the desire for a change and to have a focused picture of the farm goals. If the primary goal is to increase disposable income there may be other ways to achieve this without undertaking a major building project. Not all of a farmer’s goals will be financially motivated but every decision made on the farm has a financial implication. The implications of building a new dairy need to be analysed from many different angles so the risks of financial failure are kept to a minimum and financial targets are reached. Will the change be an upgrade or a whole new dairy? Will more cows be required to make an investment in a new dairy feasible? If extra cows are required, what will the impact be on the herd, feed, management, labour, infrastructure and debt? Make sure that all additional costs associated with a new dairy are taken into consideration when doing budgets and plans. These costs can have a major impact on the financial viability of a project e.g. will the existing infrastructure meet requirements of an expanded herd (effluent, fencing, laneways and water)? Checking that all necessary elements have been included before seeking quotes will mean quotes need be sought once only. Sending a single set of requirements to all suppliers also ensures they are all quoting on the same job, allowing meaningful comparisons to be made between quotes. The New Zealand Food Safety Authority (NZFSA) and your milk company have strict requirements around dairy infrastructure relating to milk quality and milk collection. Before beginning any construction or changes, consult your milk company. The 'Infrastructure Checklist' document is a spreadsheet checklist for making changes to milking infrastructure. The checklist may be used as a guide to work through during the design stage, helping you to determine infrastructure requirements for your farm business. Space has been provided to indicate that each item has been considered. It is a good idea to use ticks and crosses to indicate those items that are okay and those needing fixing or upgrading. Space is also provided for a brief description of the problem or upgrade required, and the anticipated cost or funds available to complete the upgrade. Keep in mind that while the checklist attempts to address all aspects when planning changes, it is does not consider every detail. All dairy farmers should base their decisions on clearly defined personal and business goals. If you haven’t already defined goals for your farm business, make it a priority. DairyNZ’s Mark and Measure courses are a way to upskill yourself in financial management and goal setting for your business. When planning a new dairy it makes sense to draw up a wish list first. This initial planning is the first step in sorting out priorities. Once the ‘must have’ priorities have emerged, financial analysis of the cost implications can begin. Decisions on upgrades need to be analysed in terms of the impact proposed changes will make to milker and cow comfort - some things may be worth paying more for. Building a new dairy is a big undertaking. Most farmers are not project engineers and have plenty of other work to do on the farm. A project manager is a valuable asset on many dairy construction projects, however it is important to ensure yours is reputable and experienced in all aspects of dairy builds. It is their responsibility to make sure that things happen on time and the desired result is achieved. Also make sure you employ a builder with experience in dairy construction. Visit other farmer’s dairies, preferably during milking, for ideas and feedback on the performance of different products. Information about robotic milking systems covering everything from what to consider, to getting started and fine tuning.